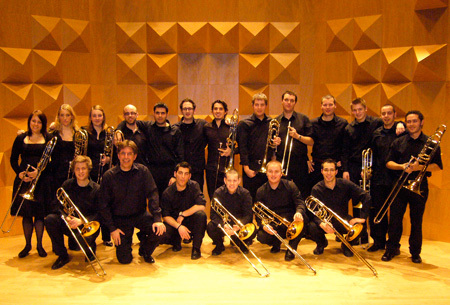 The full class with Ben after their Febr-2009 Enschede concert. We teachers, Jörgen van Rijen, Pierre Volders and I, Ben van Dijk are very proud of this success and like to congratulate our students with this wonderful result. It is the second time in our history that we participate in this competition and both times we came out as winner. 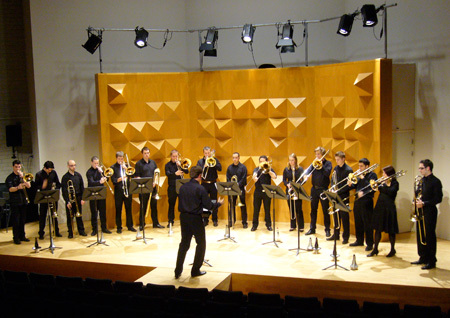 We hope to see you in Arhus at the ITF 2009 when we will receive the prize and of course will play a concert. The class in action in "Scherzo Funebre" by Derek Bourgouis. Yeah, Aarhus here we come! Denmark be ready...WE ARE COMING.......!!!!!!!!!!! !